A 20 years' effort to ORGANIZE a lot of INDICATIONS about ancient ocean explorative voyages under a LOGICAL PROCEDURE, rejecting excesses and expediencies as far as this is possible in the dimension of a simple man. A lot was written in the past about the same subject. Much of this material being under the pretension (political, ethnic, religious) common in human character. The book includes 133 photographs, drawings and watercolor paintings that help illustrate the results of a 20 plus year study of ancient explorative voyages. 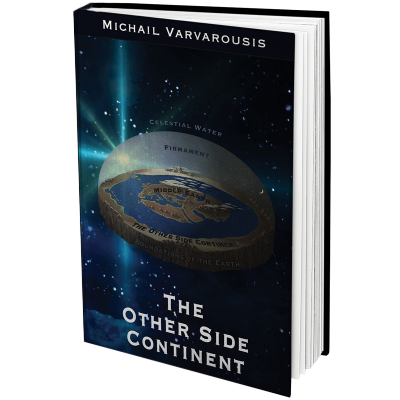 Presented in a simple, understandable format, "The Other Side Continent" details sea voyages on the world's great oceans, including all those components that give light to an ancient effort to explore the Atlantic Ocean and probably even the American Continent. A 20years effort to ORGANIZE a lot of INDICATIONS about ancient ocean explorative voyages under a LOGICAL PROCEDURE, rejecting excesses and expediencies as far as this is possible in the dimension of a simple man. A lot has been written on the same subject. Many of them under some expediencies (political, ethnic, religious) usual in human character. There are a lot of interpretations when we have only some indications for something, and our mind usually fills the gaps according to our desire, integrity, knowledge, and beliefs. Studying Medics and logical procedures in the University helped to reduce this phenomenon. It was a 20years effort researching ancient texts, maps, findings, visiting libraries, archeological sites, discussing with different kind of specialists (archeologists, traditional shipbuilders, sailors with experience in ocean voyages and ocean weather conditions). It has also proven to be useful to study some of the ancient astronomical mechanisms. Finally living for some years by the spirit of sailing in the open sea. Many Ancient Greek Texts describe a continent on the other side of the Atlantic. These texts were written from the most representative figures of the Ancient world ( such as Homer, Hesiod, Pindar, Plato and Plutarch). These texts were popular in the ancient world. But how were these texts written? Aegeans - Minoans - Mycenaeans (Νames like Rhadamanthys, Minos, Perseus, Jason and Hercules were connected with such stories). 5. Whatever it is, the popular information that on the other side of the Atlantic there is a vast continent could be a powerful incentive for later ancient sailors (under command of a powerful leader, under the passion of ambition or under the pressure of hopelessness), to try to explore the ocean and find the "OTHER SIDE CONTINENT". 14 ancient Greek texts describe a continent on the other side of the Atlantic Ocean. Yet, how was this research conducted? In 1996 I began a brief research to collect information for writing a novel regarding the story of a Byzantine sailing ship on the 15th century A.D. The resulting data revealed that the crossing of the ocean had occupied people even from the distant ancient years. In this light I would begin a few years later a more detailed research that would attempt, using the academic experience, to discover more ancient descriptions about ocean voyages, to organize them and to reach some logical conclusion on the way that they were written. The study of the literature on the matter of the ancient oceanic sailing. The use of digital programs of the ancient Greek literature, in order to search for texts referring to oceanic navigation. The research on selected websites about these subjects. Visit libraries with archives on this subject. Organize the whole material under a logical continuity. The results had to be examined regarding their authenticity and to be analyzed according to the contemporary views of archaeologists, the capabilities and the particularities of sailing during the ancient years, the matters of orientation at open sea as well as the study of the weather conditions and phenomena of the ocean. The acquisition of the sailing boat AGIA IRINI Gre-1390 was also proved very important due to the experience that rose from the sea voyages and the sailing races at the open sea. In recent years, while exploring the possibilities of publishing this book or presenting a documentary on this topic, a lot of resistance and many obstacles have emerged, something that would make anyone wonder about the underlying cause. The same topic has caused an upheaval over recent decades because of the phenomenon of Pseudoarchaeology. There have been many cases where false interpretations or fake data have been used as historical evidence. Many of these cases had to do with the authenticity of documents, others with ancient inscriptions, golden, silver and bronze plates or clay pots that never existed, as well as interpretations or hypotheses about archaeological data that would not agree with the commonly accepted theories. It is well known that history establishes a political, national and religious background that supports specific ideas. Several cases of such debates have taken place among historians since the ancient times. Subjectivity, limited understanding or different perspectives of a speciﬁc topic can be considered as the main factors, among others, for these arguments. During its evolution, science has been challenged, criticized and altered, but it has also contributed to the development of old ideas. This can be observed in the evolution of human perception on many topics as well as in the expansion of humanity’s overall level of understanding. Today’s the United States play a signiﬁcant role in modern culture and has often been at the center of debate for topics such as the one discussed in this book. However, the truth is an essential requirement for humanity to build on solid foundations. The collection of ancient texts and maps included in this book is the result of many years of research, and it provides indications that oceanic exploration missions might have taken place in the Atlantic Ocean during the Ancient times. However, a more rigorous analysis is necessary to further evaluate those ﬁndings. The photo shows some of the many cases where false interpretations and data falsiﬁcation associated with theories about the discovery of America since the Antiquity. The "Phoenician" inscription of Paraiba, lost Middles East tribes in America (from the Book of Mormon), Minoan clay pots on the Bimini islands and Freemason pyramid structures in the Canary islands.